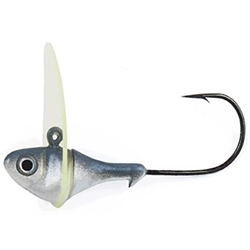 The Patented Fish Head Dude™ (2pk) — is the perfect addition to our Fish Head Spin™ line of products. The Fish Head Dude™ is designed to serve as a shallow running/waking search tool. The Fish Head Dude™ can be fished through blow-downs, rock, wood, as well as grass. With its fluorocarbon urethane blade, it is virtually weedless and its multi-stage painting process yields a highly realistic finish. Add your favorite curly tail, paddle tail, or fluke style trailer for great action. The Fish Head Dude™ mimics a baitfish swimming through the water, which attracts all species of fish. The Fish Head Dude™ is most commonly used for bass but was originally created for the in-shore salt-water market. No fish can resist the realistic look and action of the Fish Head Dude™!